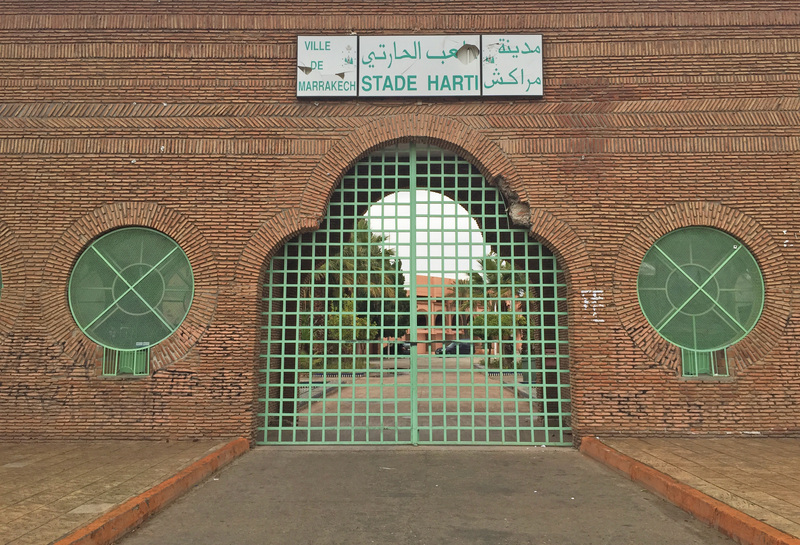 Until the opening of the Grande Stade de Marrakech in 2012, the Stade El Harti was the biggest football ground in this great city. Built in the period of the French protectorate it would still easily hold 10,000 spectators. Situated just outside the old city walls in the Avenue du President Kennedy, the old stadium is the very definition of fading elegance. 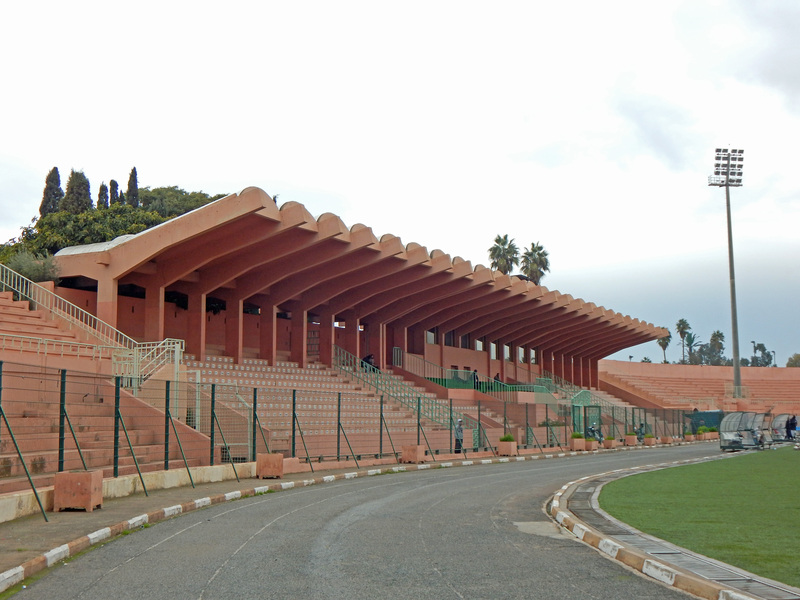 Since Marrakech’s biggest club, Kawkab Athletic Club, moved into the new Gregotti Associates designed arena, which is situated some way out of town in Ouahat Sidi Brahim, the El Harti has been reduced to hosting games for Marrakech’s clubs that currently compete in the third and fourth tier competition, the Moroccan Amateur League. 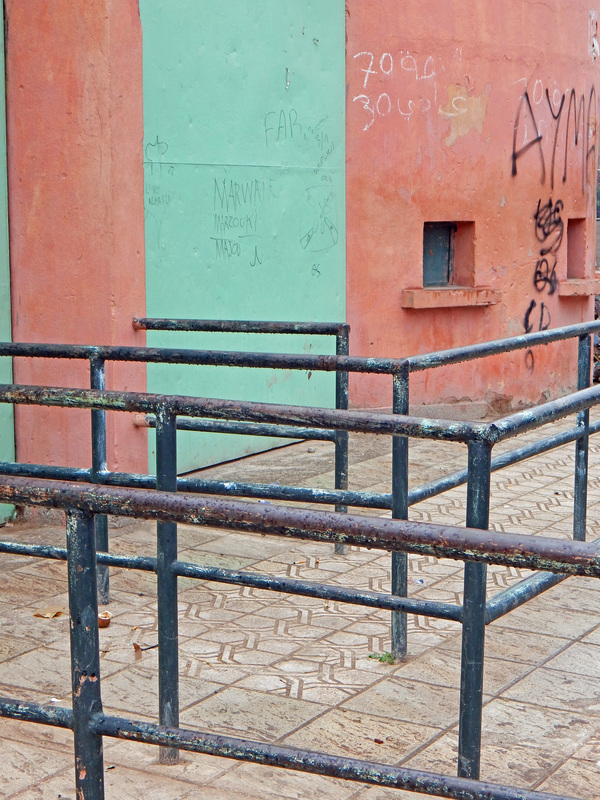 Of the tenant clubs, Olympique Marrakech are best placed to bring Botola Pro football back to the El Harti. In fact they only dropped out of the Pro League Second Division at the end of the 2012/13 season when they finished bottom of the table ten points adrift of safety. 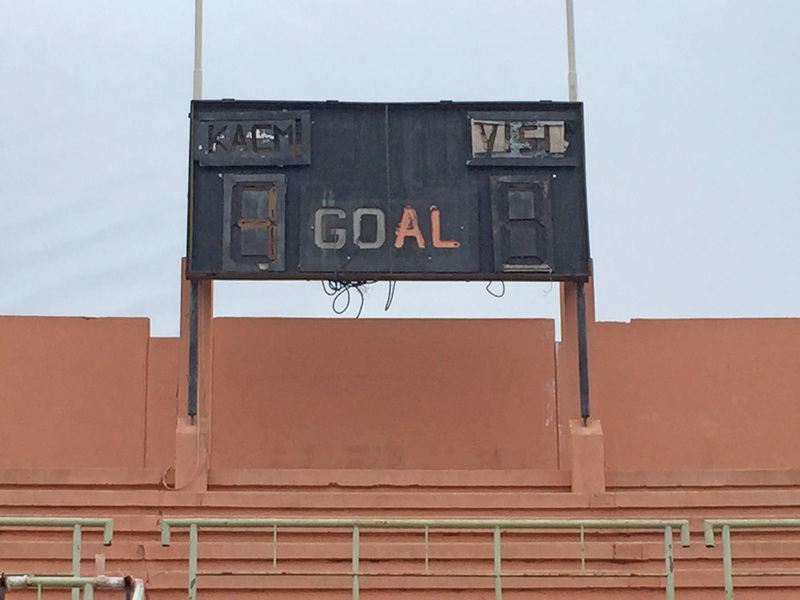 It was a year that saw Kawkab win the Second Division to return to the top flight. Olympique were formed in 2001 by the owner of the famous Marrakechi restaurant Chez Ali, and currently stand in a promotion place for a return to the Pro League. 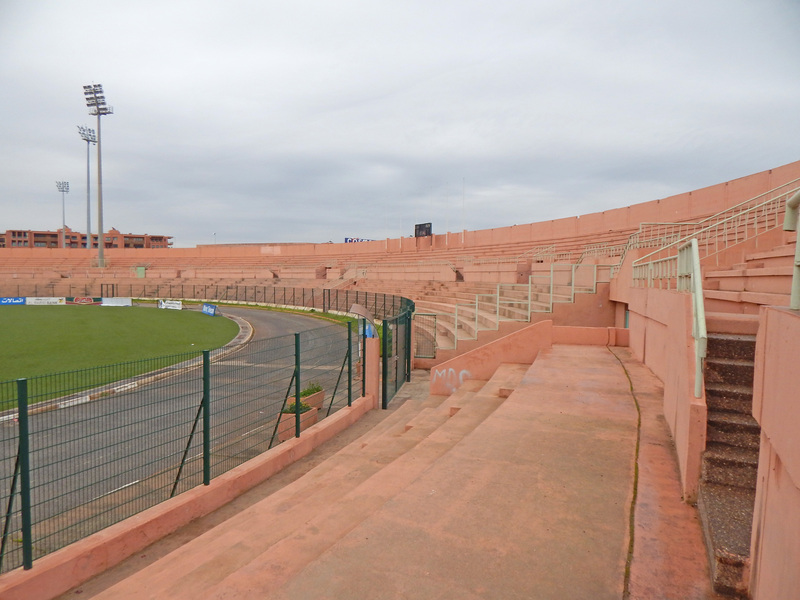 The city’s other third tier club Najm Marrakech still play at the Stade 20th August which is in Avenue Oued Lmakhazine in the suburb of Menara. The El Harti’s other occupant is today’s host club MCM Mouloudia Marrakech who play in the fourth tier of Moroccan football, the Amateur League Second Division. It’s been a sharp decline for Mouloudia who spent a single season in the Moroccan top flight in 1980/81 but finished next to bottom of the eighteen team league. The club were formed in 1948 as Alioria Marrakech with most of the team coming from the Bab Doukkala district of the old medina. 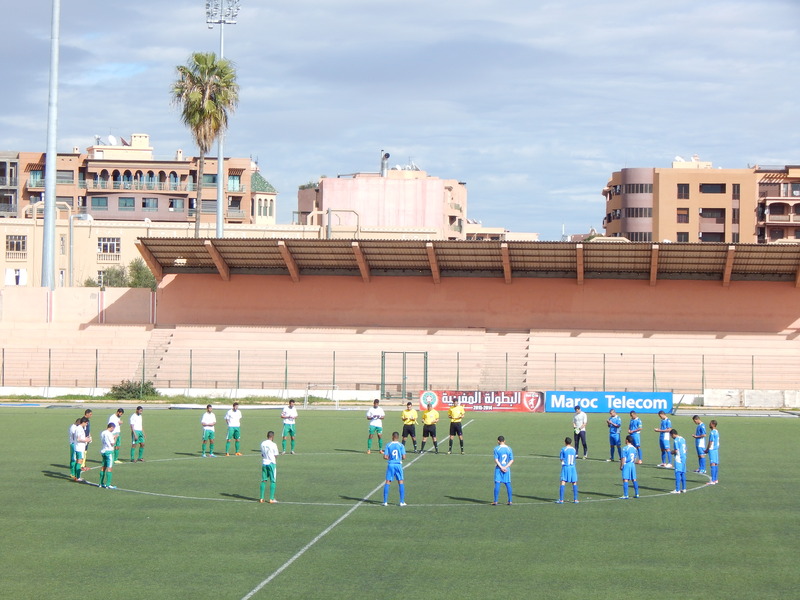 They initially played at the old Terrain Akecich before sharing the Stade 20th August with Najm Marrakech. All their first team games these days are played on the 3G surface of the El Harti. 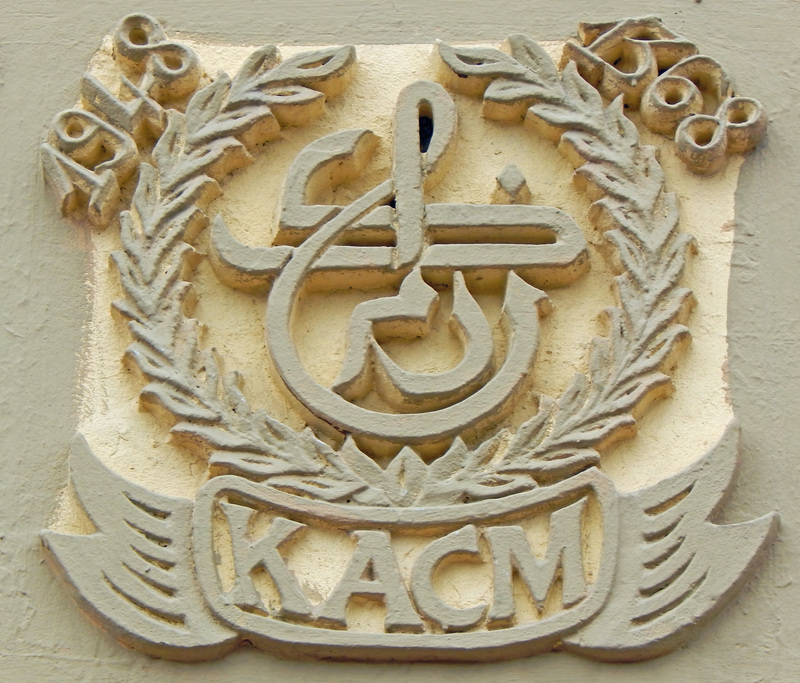 The Mouloudia club have a currently much more successful handball team. 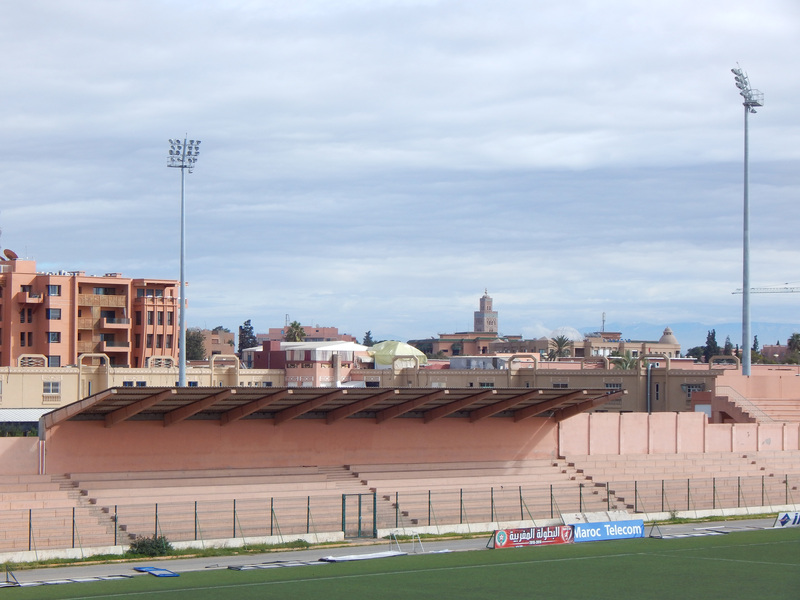 The Stade El Harti is built from the distinctive terracotta coloured stone associated with Morocco and has an impressive main stand with a roof supported by some seriously reinforced concrete. 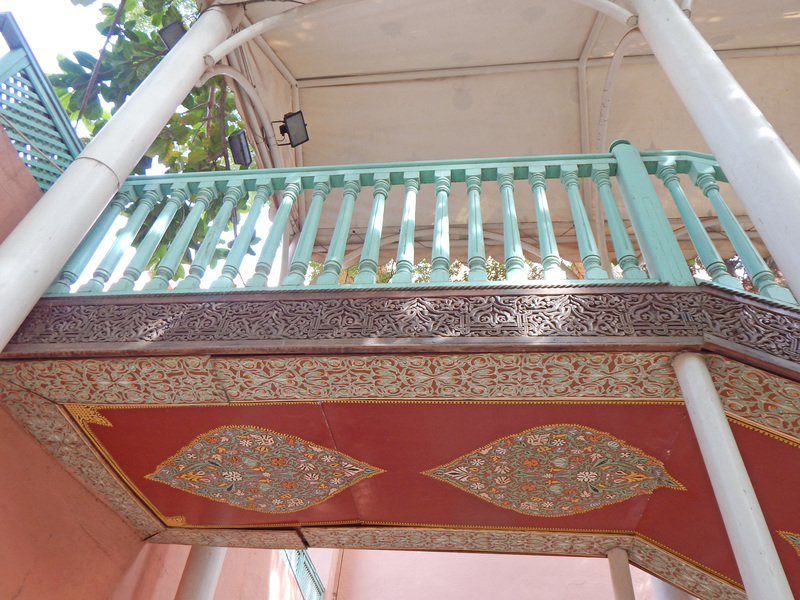 The stadium in its heyday would have looked great, the external stairways are artistically decorated and the entrance to the stadium is a real masterpiece. Today the fascia of the stadium bearing its name has been smashed and a chunk of masonry has fallen off the stunning arch. It’s a shame big crowds no longer gather here and little maintenance, save for the installation of an artificial pitch, has taken place in recent years. 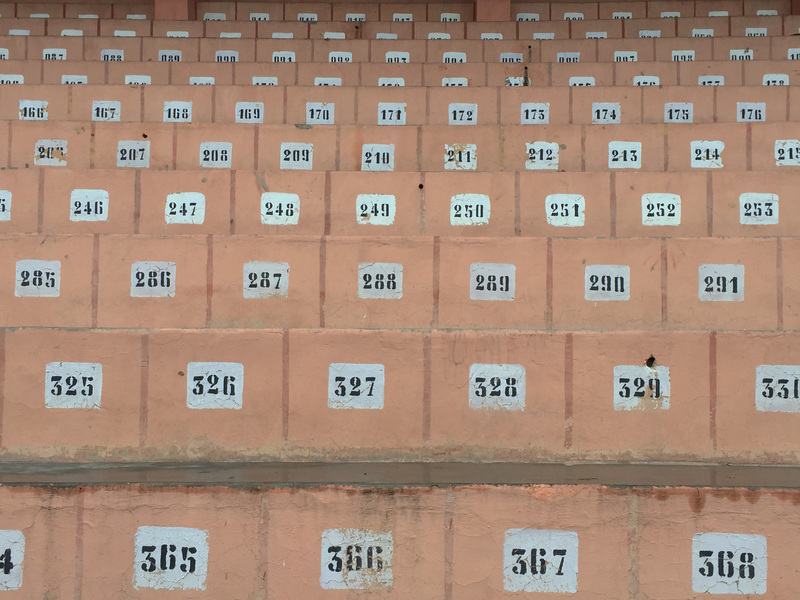 The rest of stadium is made up of two end curves of open terracing and a terrace opposite the main stand which is partially covered to provide some shade from the unrelenting Maghreb sun. Today’s game sees Hilal Tarrast make the long four hour trip from Agadir for this fixture. No admission is charged and no information is available as to who is playing for either team. There was a goalless first half which was held up for seven minutes when the manager of the visitors was asked to leave the technical area and refused to do so, encouraging his team to leave the pitch instead. Order was eventually restored and the coach cut a solitary figure sat alone in the covered terrace for the remainder of the game. It was the hosts that took the lead after 67 minutes when their captain nodded in a dangerous corner. It looked like that would be the winner until four minutes from time when the opposition’s centre forward, who had spent the entire game play acting and diving, gleefully lashed home a loose ball which really should have been cleared. It was a poor quality game on an artificial surface that has not been maintained well and had some disarming bounce to it. Should Olympique successfully return to the Pro League it would be nice to think some money could be lavished on the old El Harti in its dotage. 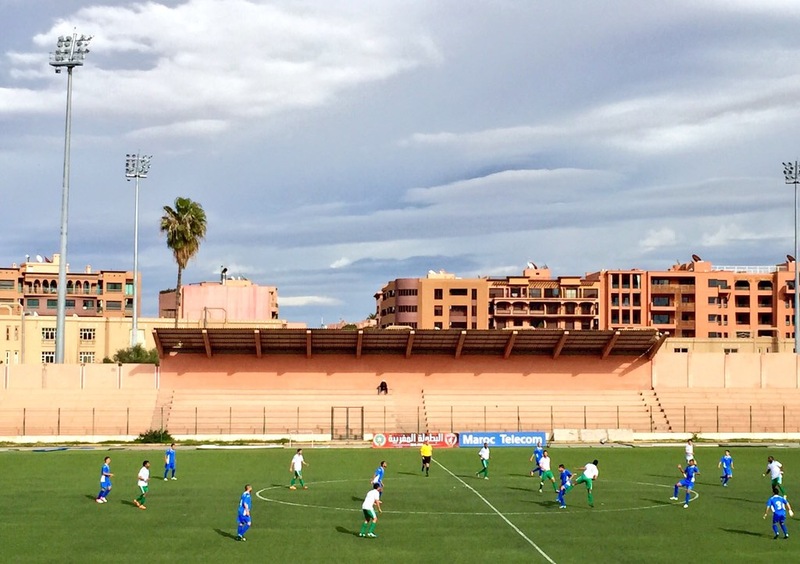 This entry was posted in Travel, Matches & Stadiums and tagged groundhopping, Kawkab, Marrakech, MCM Marrakech, Morocco, Mouloudia, Olympique, Racing Club, Stade El Harti, Stadiums by peterrmiles. Bookmark the permalink. Hi Peter, nice to see that you’ve been here as well. We have shot almost the same pictures😁. I have been there 2 years ago and it was kind of abanded. My wife’s family is from Marrakech and as a fan of stadiums I had to go once. Goodluck with your site and grondhopping adventures.